The International Compost Awareness Week Committee invites YOU to get involved in ICAW 2019. We’re looking for anyone interested in participating in our 17th Annual Poster Contest. The winning poster will be used to promote International Compost Awareness Week, May 5 -11, 2019. POSTER THEME: Cool the Climate – Compost! The contest runs from September 1 until November 5, 2018 and is open to anyone who wishes to share their artistic creativity to promote this year’s theme. 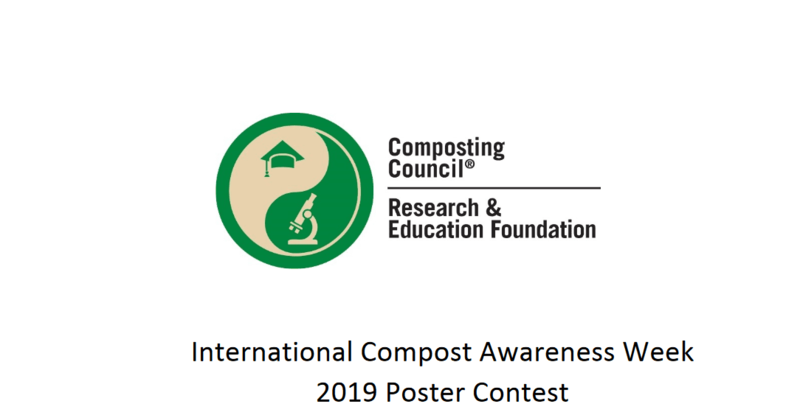 The winning poster will serve as the promotional piece to share nationwide the 2019 International Compost Awareness Week theme. ICAW invite municipal, facility or state agency representatives, industry professionals, students, youth groups, commercial composters, green industry businesses, gardeners, environmentalists, EVERYONE, to join in the fun Whether or not you have celebrated or been involved in ICAW in the past, we want you to participate this year. The contest is open to anyone ten years old and up from anywhere in the world. The 2019 ICAW theme, “Cool the Climate – Compost!” recognizes the connection between soil health and the climate. Soil plays an important role in our environment. Healthy soil is at the heart of planetary, agricultural and human health. This year’s theme highlights that soil management practices with compost is key to soil health and migrating climate change. By composting, we return nutrients to the soil, help capture carbon from the atmosphere, resist drought and disease and provide fresh air. The successful poster winner will receive a $500 prize. The contest is open to anyone from ten years old to adult. There are 3 contest divisions: grades 3-7, grades 8-12, and college – adult. The best from each division will be entered into the final contest. The winning design will be chosen before the end of the year. 2019 Commonwealth Short Story Prize Writing Contest for unpublished short fiction (£15,000 in Cash Prize).